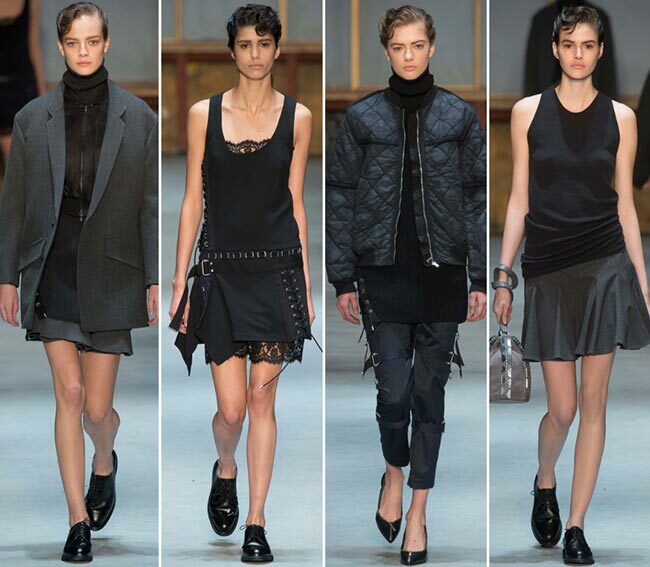 The inspiration of the Diesel Black Gold fall/winter 2015-2016 collection is juxtaposition according to Andreas Melbosta, the creative director of the fashion house. It certainly is a mouthful to utter the word and even more complex to explain it. In essence, in means the act or instance of placing two or more things side to side, pieces put close together but with contrasting effects. In a literary context it means putting two or more ideas together that are opposites in an effort to compare and contrast between them. 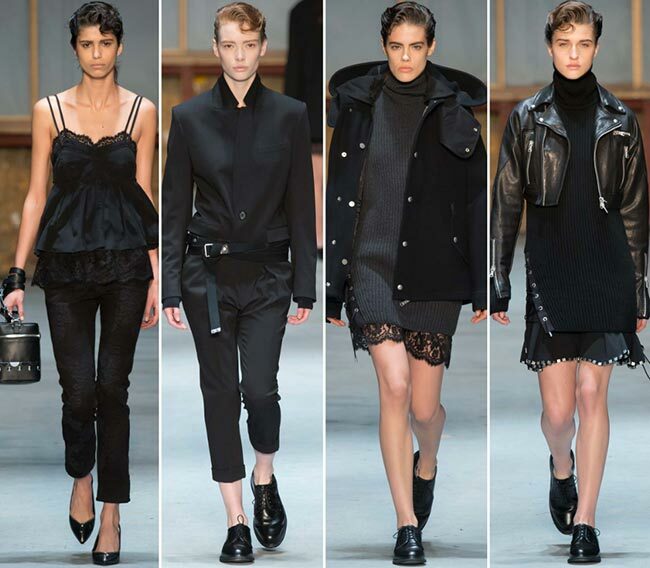 In this collection, what we see is the hyper-masculine meeting the hyper-feminine; the leather meeting the lace, the darkness shining bright with the light. 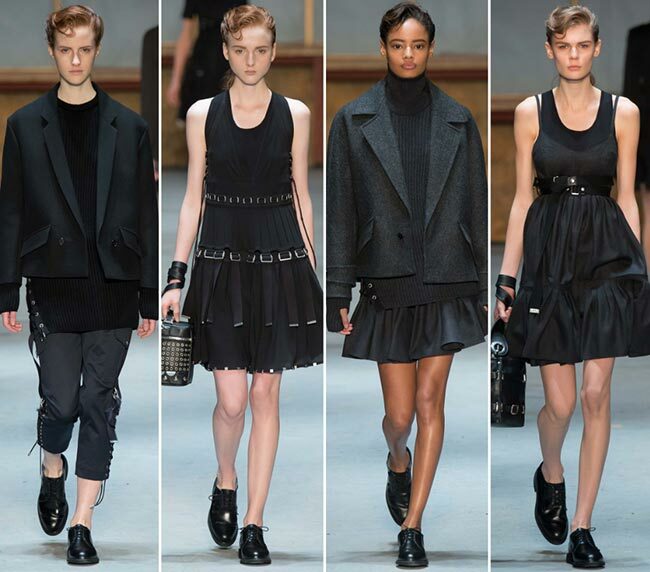 It’s an interesting concept and so very suited to the Diesel Black Gold label. While Diesel itself may be an Italian brand that’s been around since 1978, the Diesel Black Gold line is less than 10 years old and yet so very dear to so many young hearts. It is all about the contemporary here, made for the woman looking for an edgy rock chic fashion that suits her sophisticated nature but still allows the rebellious nature within her to shine through with bold strength. According to its official website, the Diesel Black Gold line “takes its parent brand’s irreverent attitude and innovative techniques to new heights of quality and refinement.’ We can only imagine how proud the parents should be seeing the success of this type of fashion line. Growing up, we were often faced with the infamous Diesel store from whence the wealthier classmates would be shopping and showing off their newest jeans and T-shirts. 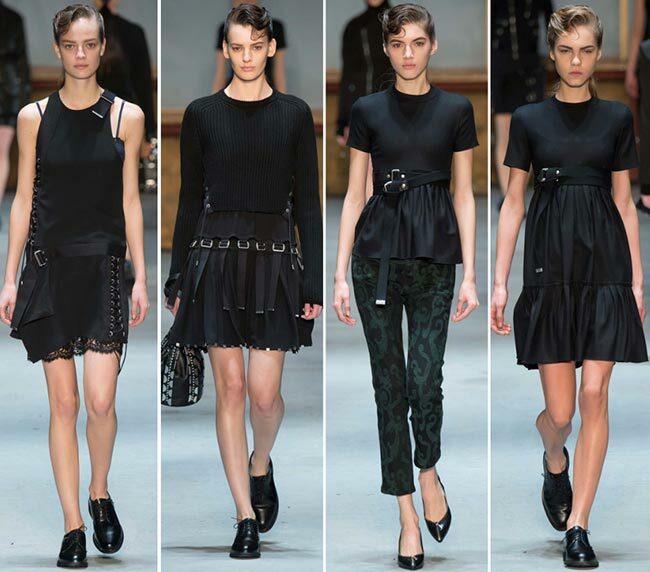 Today, instead of jeans and tees, we are looking at almost boyish cuts, with boxy designs and specific tastes. The Diesel Black Gold fall/winter 2015-2016 collection is not meant for everyone, but everyone can find at least one piece that suits her fancy. Whether she likes the ankle clopped fitted trousers or the pleated and buckled skirt, the long knit tunic or the lacy plus laced edges with buckle look to the mid-thigh length skirt, the fitted or the boxier designs, a woman has it all. The only problem may be the lack of colors to choose from as Diesel Black Gold has refrained from using gold but has certainly loaded up on the black and the navy. 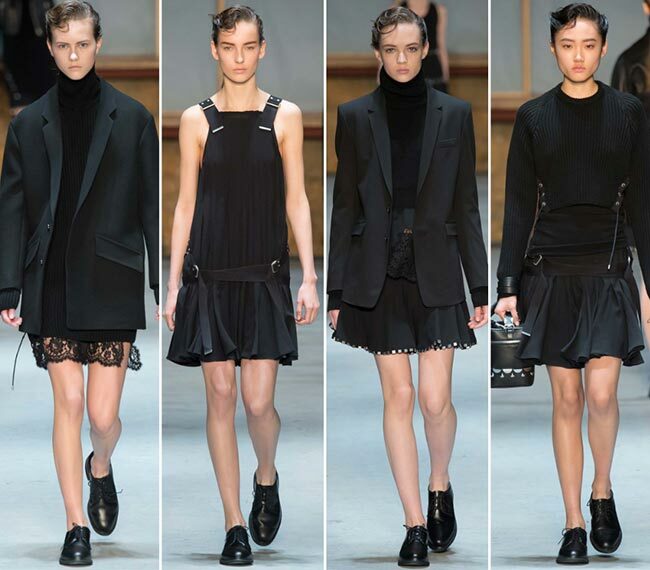 Probably one look we find perfect for the workplace is the blazer over the knit black sweater with the high turtleneck and the skirt that can be interchanged with something that reaches at least just above the knee, deciding against the mini skirt. The uniforms that appear somewhere in the middle are also quite appealing, what with their double breasted high collared shirts and frilly or buckled up mini hemmed skirts. At least the shoes are quite utilitarian! We start off with a blazer look with a lacy skirt hem and finish off with pretty pumps that are just about the only feminine thing on the outfit that includes a bubble jacket, a long knit sweater tunic and cropped pants that are full of buckles. It may not really be the definition of chic and sophisticated this time around, but the chic with casual combination certainly may work well this time around.